Hiking in the Upper Bunderitsa Valley near Dulgo Ezero ("Long Lake"). The peak of Graniten rises in the background. 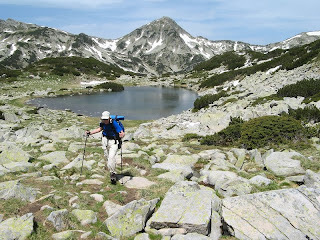 This is a classic Pirin Mountain hike over the pass of Todorina Porta. The glorious alpine lakes of the Bunderitsa and Vasilashki basins are highlights of the hike!